We now have wild Alaskan Salmon from the famed Yukon River. This is the longest river in Alaska. Don't miss this very short season. The Yukon River is home to one of the longest salmon migrations in the world. From the headwaters in Yukon Territory and British Columbia, Canada to the mouth at the Bering Sea, the salmon returning to the Yukon River swim over 2,300 miles to their spawning grounds. Traveling up Alaska's longest river, the Yukon River salmon need high levels of Omega-3 essential oils to sustain their journey. Prior to their return, the Chinook salmon spend three to five years in the Bering Sea while the summer chum salmon also swim in the Gulf of Alaska on their migration routes. The high oil content developed along their feeding routes is needed for both the Chinook salmon, and fall chum salmon spawning in Canada. In addition to the Canadian spawning grounds, there are numerous pristine spawning grounds in Alaska that support not only Chinook and fall chum, but summer chum and coho. All of the salmon returning to the Yukon River have a remarkable journey that provides a rich and unforgettable flavor and is why Yukon River salmon are prized as one of Alaska's top premium seafood products. Yukon, meaning "Big River" in Athabaskan, starts in Canada and empties into Alaska's Bering Sea (view map). The Yukon ties as the 2nd longest river in North America (2,300 miles / 3,185 km) behind the Mississippi and Missouri River. The Yukon valley that runs horizontally thru Alaska is believed by some anthropologists to have been the main immigration route for North America's first human inhabitants. Every year, the Yukon River hosts the longest upstream migration of Pacific salmon stocks in the world. The people of the Yukon River drainage have been utilizing these returning salmon for over 10,000 years. For Alaska Native groups who have, and are still residing in the drainage, fish resources provide the foundation for their survival and livelihood. Following tradition, annual fish camps are set up with nets and fish wheels to harvest the plentiful salmon resource. Fish were exchanged for beaver, marten, mink and other marine resources such as seal oil. Fish skins were used to make waterproof parkas and boots. Native Alaskans and others who reside along the Yukon River drainage still rely on the fish and wildlife that surround their area. The Yukon River was one of the principal means of transportation during the Klondike Gold Rush in the late 1800's. Paddle-wheel riverboats continued to ply the river until the 1950s when the Klondike Highway was completed. Commercial fishing on the river dates back to the turn of the last century and has provided hundreds of jobs each summer. Commercial fisheries also help to fund subsistence fishing for Alaska Natives. Revenues are used to buy nets, gear and other equipment needed in their remote locations. Today, close to 900 local residents catch Yukon salmon along the river. Many of their techniques have been used for hundreds of years and the Yukon is the only area of Alaska where salmon are commercially harvested by fish wheels. Whatever the method, fishing binds Yukon River people and communities together. 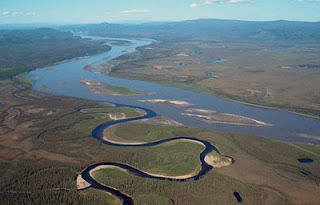 The Yukon River, the largest river in Alaska and one of the longest in Canada, has nine major rivers and many tributaries which continually flush water through the drainage on a regular basis. The Yukon River Wild Alaska Salmon fishermen and processors are proud to harvest their salmon from a fishery recognized as sustainable, meaning "able to be continued indefinitely without a significant negative impact on the environment or its inhabitants. The State of Alaska has a policy for the management of sustainable salmon fisheries that ensures conservation of salmon and salmon's required marine and aquatic habitats, protection of customary and traditional uses, and the sustained economic health of Alaska's fishing communities. The Marine Stewardship Council (MSC) has certified Alaska's fisheries and those of the Yukon River as sustainable. To earn this certification, the fisheries are subject to robust and rigorous scrutiny. It is hard to find a more thorough certification and auditing process for any commodity in the world than the one the MSC has developed for fisheries. The MSC standards require the highest levels of compliance and the requirement that the fisheries continually improve after certification. These improvements are regularly audited and further enhance the credibility of the program. The rigor of the standards explains why after seven years into the program, only 12 fisheries worldwide have been MSC certified. Sustainable salmon runs on the Yukon are very important to both subsistence and commercial fishermen, as salmon make up a large part of people's diet and income. All salmon runs on the Yukon River are closely monitored to make sure that they are not over fished and that an adequate number of fish are allowed up the river to spawn. The Yukon River fisheries are monitored not only by the State of Alaska and the United States Fish and Wildlife Service but by the Canadian Fisheries as well. The international Yukon River Salmon Agreement between the U.S. and Yukon Territory, Canada leads to joint decision-making over how to protect and conserve and utilize the salmon resource.